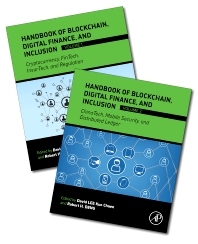 Handbook of Digital Finance and Financial Inclusion: Cryptocurrency, FinTech, InsurTech, Regulation, ChinaTech, Mobile Security, and Distributed Ledger explores recent advances in digital banking and cryptocurrency, emphasizing mobile technology and evolving uses of cryptocurrencies as financial assets. Contributors go beyond summaries of standard models to describe new banking business models that will be sustainable and likely to dictate the future of finance. The book not only emphasizes the financial opportunities made possible by digital banking, such as financial inclusion and impact investing, but also looks at engineering theories and developments that encourage innovation. Its ability to illuminate present potential and future possibilities make it a unique contribution to the literature. A companion Volume Two of The Handbook of Digital Banking and Financial Inclusion: ChinaTech, Mobile Security, Distributed Ledger, and Blockchain emphasizes technological developments that introduce the future of finance. Descriptions of recent innovations lay the foundations for explorations of feasible solutions for banks and startups to grow. The combination of studies on blockchain technologies and applications, regional financial inclusion movements, advances in Chinese finance, and security issues delivers a grand perspective on both changing industries and lifestyles. Written for students and practitioners, it helps lead the way to future possibilities.